Note: 2018 findings from these questions can be found here. Beyond partisan differences over economic policies, there are stark divisions on a fundamental question: What makes someone rich or poor? Most Republicans link a person’s financial standing to their own hard work – or the lack of it. 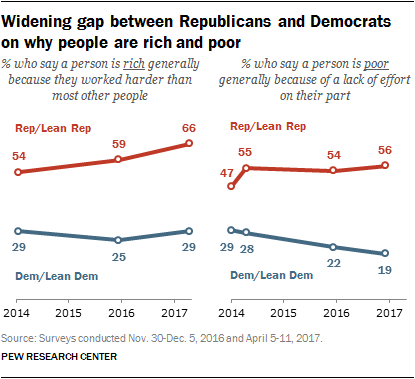 Most Democrats say that whether someone is rich or poor is more attributable to circumstances beyond their control. The public overall is about evenly divided over which has more to do with why a person is rich: 45% say it is because he or she worked harder than most people, while 43% say it is because they had more advantages in life than others, according to a survey conducted April 5-11 among 1,501 U.S. adults. Opinion has shifted modestly on this question: In both 2015 and 2014, more attributed a person’s wealth to greater advantages than to a stronger work ethic. Views of why some people are rich and poor vary by gender, education and income level as well. For example, men (49%) are slightly more likely than women (41%) to say that hard work is more often the reason why someone is rich. Men (42%) also are more likely than women (26%) to say that a lack of effort is more to blame if someone is poor. Those with postgraduate degrees are more likely to say that having more advantages in life has more to do with why a person is rich (52%) than they are to say hard work has more to do with it (34%). Those with less education are more divided on what has more to do with why a person is rich. When it comes to the reasons why a person is poor, majorities of postgraduates (62%) and college graduates (59%) say circumstances are generally to blame. Most of those with some college experience (54%) also take this view. Among those with no more than a high school diploma, about half (49%) point to circumstances as the reason why a person is poor, while 38% cite a lack of effort. People with higher family incomes are more likely than those with lower incomes to say a person is rich more because they work harder than because they had more advantages. There are only modest differences across income categories in views of why someone is poor. Note: View full topline results and methodology here (PDF).